Florals are in, and I am happy about that. This fabric has been in my collection for a few years now. When I first bought it I pictured a dress, but for a long time I've shy-ed away from wovens because of the lack of stretch/ comfort. Let me tell you, this dress has both! I was surprised to see how much give it had after I ran the fabric through the laundry. *always pre-wash your fabric unless it's dry clean only! I used to skip this step out of impatience, but there is nothing worse than spending hours on something only to have it shrink, or worse, shred in the wash! Now lets talk about FBA's. A Full Bust Adjustment is for any pattern user who has a bigger bust size than a B cup. Whenever I've sewn a dress I've always done the adjustments after the bodice was made and then altered the fit there, it is a pain to do it that way especially if you have no one to help/ understand what you're doing. By doing the adjustments to the pattern rather than you're fabric you're saving a ton of time, fabric and curses! And it was surprisingly a lot easier than what I expected! "The first step in determining what size to start with is to measure your upper bust. This is the area above your bust, around your body under your armpits. Use this measurement instead of your full bust measurement to determine your size. By using your upper bust measurement, you will be choosing a size that fits your frame, not your fluff." I now have a sloper/bodice/block that fits me perfectly which means I can make any dress I want without having to buy a new pattern or make a muslin. Talk about a massive time saver! 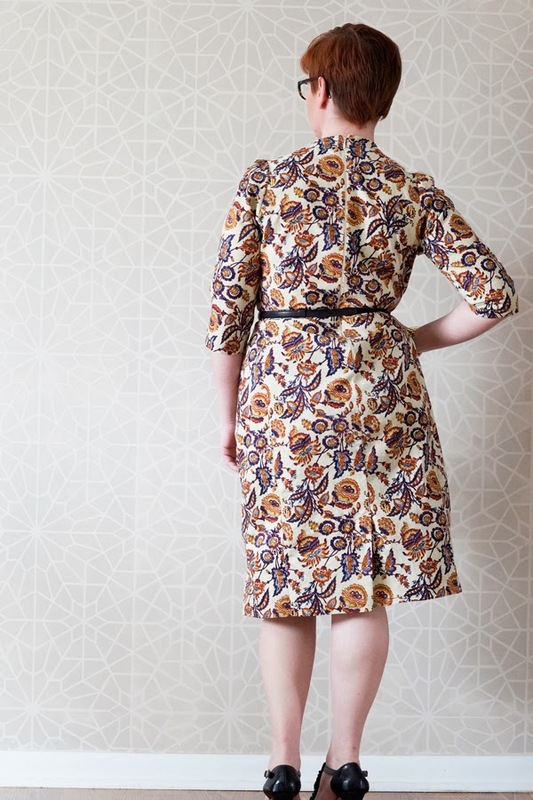 The patterns I used to make this dress are the peplum bodice, skirt & sleeves. I added a kick pleat to the skirt for added ease. It took a week of debating on the sleeve before I settled on the 3/4 but I think it helps the with proportion. After all I am a 5'1" girl in an all floral dress. Oooh! Love it! I am not a big floral person but that cut and design look amazing! Good job!